Kelly created and operates my favorite blog, Old House Dreams, and in previous posts about the Great Drapery Search (here and here and here and here), Kelly stated that she had, by some miracle, found four drapery panels. I responded that while I believed her, I doubted that the online order at Walmart would go through, because all my orders were later cancelled (it appeared that Walmart was out of stock, but Walmart could not confirm this!). So, Kelly and I waited with bated breath for the order to be cancelled. Sigh. Well, one panel was better than none. A few days later…Kelly received another shipped notice…for three panels. However, yet another problem soon developed with the Great Drapery Search. Kelly used as a shipping address the Cross House. But I live 20 miles west. 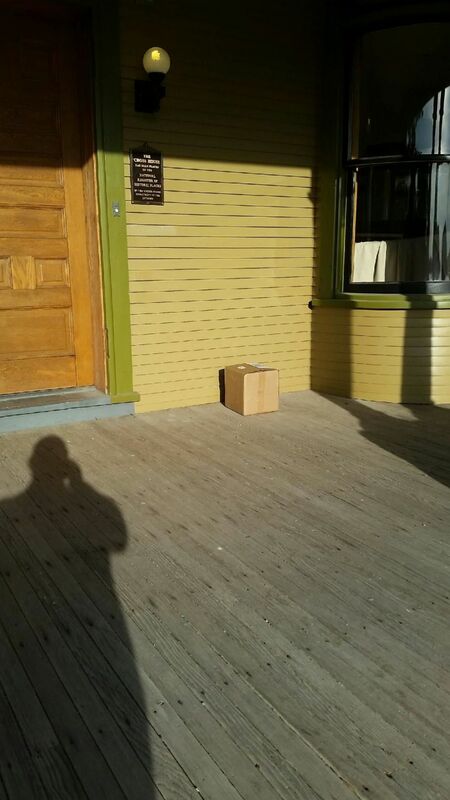 This meant that when the boxes arrived, they would be left on the porch, and likely stolen. So I kept alert to the tracking numbers as each box inched ever closer to their destination. Of course, of course, the boxes would arrive on days when I was not at the house. Of course! When I received confirmation that Box 1 had been delivered, I texted my neighbor Eric, and asked if he could grab the box. Eric, being a great neighbor and person, seemed happy to help. 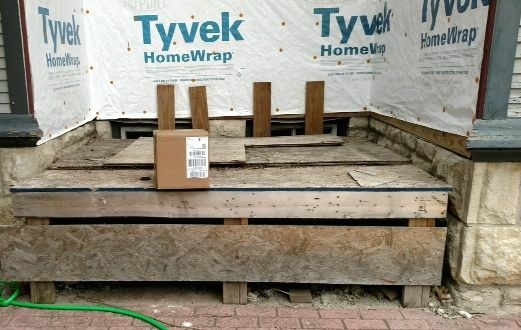 Eric let me know he tucked the box under the temporary deck. Thanks, Eric!!!! A few days later I knew that Box 2 had been delivered. When I was not at the house. Not wanting to bother Eric again, I contacted Brad, who lives right behind the Cross House. Brad graciously agreed to Help Save The Box! 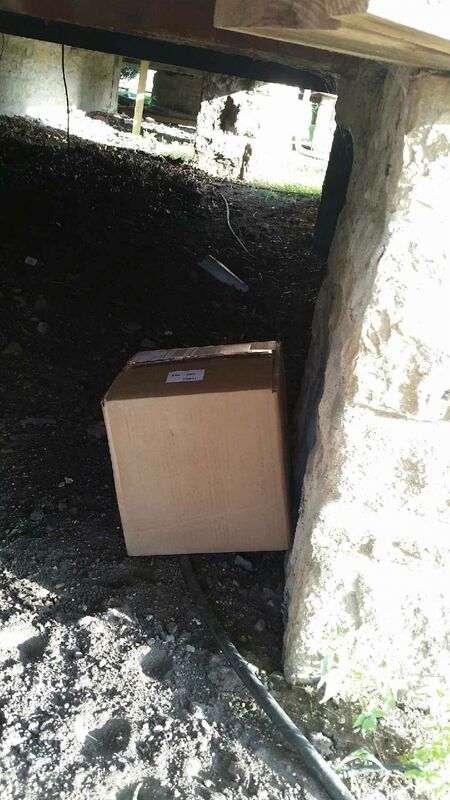 Brad sent an image confirming that the box was, indeed, on the porch. The image is also quite wonderful, in a Hitchcock-like way. It seems so ominous! Then, another image showing where Brad had tucked the box. Thanks Brad!!!!! Ya’ gotta love such neighbors! So, thanks to Kelly (four panels), and Brian and Bailey (four panels), I now have the eight panels needed for the library!!!!!!!! EIGHT PANELS!!!!!!!! In all the confusion if I would receive ANY panels, I managed to find two on Amazon. I placed an order with alacrity! Two days later the order was — you guessed it — cancelled. OUT OF STOCK. But two days after that I received an email stating that two panels had been found, and were now shipped! Who knew that ordering drapery could be so utterly ridiculous and vexing? Well, I now have TEN panels. However, Victoria commented on one post that she had purchased two more panels, and was on the hunt for more! 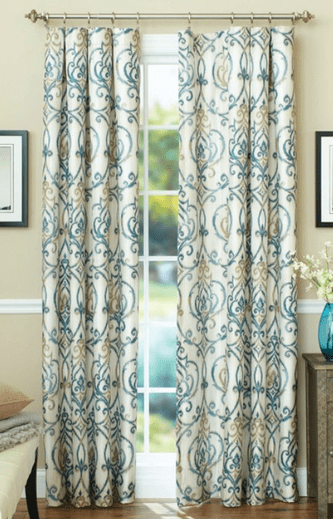 As I also want to do the living room in the same drapery (masochist that I obviously am), I will need TEN panels for this room. With the TWO extra I now have, and the TWO (at least) which Victoria has purchased, that leaves just SIX more needed. Hummm. I can’t yell at somebody for being…lovely & gracious, but then thought: Hey! I also love giving gifts! I will send Kelly a gift (this presupposes she will ever give me her address!). But, because I am a guy, and thus genetically incapable of buying a great gift for a girl, I need help. What would be the perfect gift for Kelly????? And, if Kelly does not forward her address, what gift can be sent via an email address? Because I have the latter! 21 Responses to Kelly! MY HERO! You can always send amazon gift cards with just an email address. Then she can buy whatever her heart desires! Or, check to see if she has an amazon wishlist by plugging in her email on the wishlist page. You have written wise words. And it shall be done! I was really worried that I had used your mailing address for the house, glad they arrived and were safe! Yay for good neighbors! As for a return gift, seeing the finished room will be gift enough. Seriously! 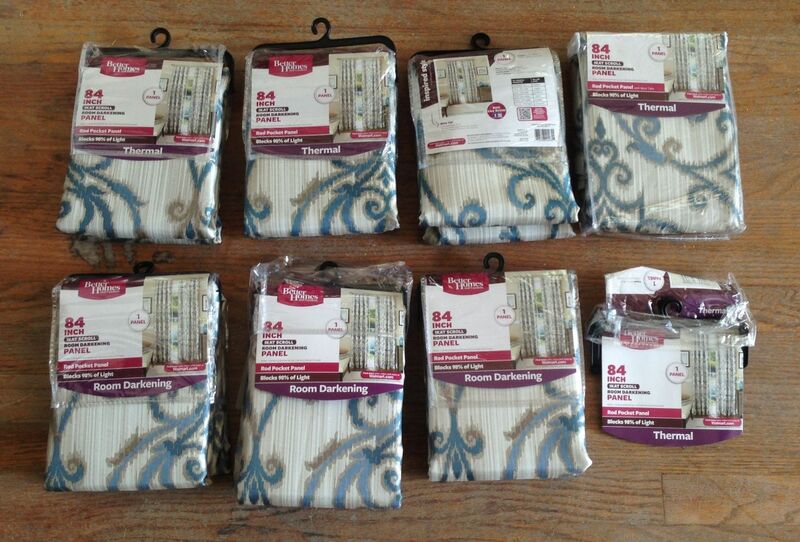 So, we found four MORE sets of curtains…back at the Wal-Mart we found the first four. We asked them if they had any more in the back, they scanned it, and the system said they only had TWO in stock, despite us carrying double that. Their system also said they had more on the way, though I’d take that with a grain of salt. Also, no clue when we’ll be back down to Emporia, but it’ll be sometime soon. Maybe by then the other curtains will have arrived, and you can do the living room all at once! I will take them!!!! Whoee!!!!!!!!!!!!!!!!!! Heading to the only other walmart in my area tonight that says they have them…..derby! Hopefully I will secure the last 2 for you tonight! I am crossing my fingers! And toes! Well sadly last night was a flop. But I’m not giving up hope. My store has them on order! Just not sure on the time frame. 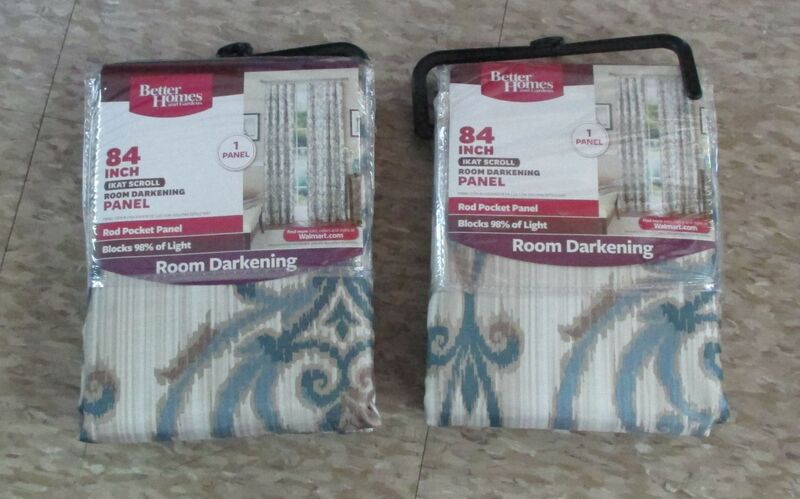 Sit in your chair……I have come to the rescue and FOUND THE FINAL TWO CURTAINS! Where did you find them????????????? Managed to find them shortly after they were delivered to the west kellogg walmart in wichita! Ross, I get all my drapes from here. They have thermal, room darkening etc and best part? Around Christmas time all their products are marked 50% off what the price listed on the page. I ended up getting the tall 11 ft draperies for my parlor for a steal. Good luck! It’s fun to actually have nice things after living in so much dust isn’t it? NOTE TO READERS: Matt has done an incredible job with his 1899 house. His blog is a must read. Alrighty, looks like Bailey and I are going to be coming down Thursday morning. We don’t know exactly what time, but we’ll be in town most of the day. Is there any particular time that works best for you? Do you have my cell number? Just found this wonderful blog via the link in today’s (12/3/2016) Emporia Gazette article. How did I not know this? I have LOVED the “Mouse House”–as it was known in the 70’s when I first moved to Emporia–for years! I have nearly wept over the sad state it was in for a long time and am now jubilant over the progress you are making with her. I am making progress on the blogs but have over a year to go to get current…no skipping ahead, even though I often drive by and marvel. You MUST, MUST, publish your journey, as I see historical tours in your future and they could help “fund” maintenance at least a bit.